Greenhost Review 2019: Is Greenhost a Good Hosting? As its name implies, Greenhost provides hosting that is environmentally-friendly. With data centers in Finland, Central Europe, and the United States, it offers hosting solutions that are simple and effective for personal and small business websites. Web hosting is energy-intensive, generating up to 4,500 pounds of CO2 every year and contributing negatively to our environment. Greenhost is one of the hosting pioneers dedicated to providing high quality and carbon-free hosting in Finland. The company is a certified partner with Carbonfund and offers hosting that’s simple and effective for small businesses. With a website in Finnish and data centers in Finland, Central Europe, and the United States, this company provides hosting with a high level of service. The gH Base plan is not suited for much more than the most basic websites (such as a portfolio or personal blog) due to its limits on storage space, data transfer, and FTP access. You only get one FTP account, 500MB disk space, and 10GB bandwidth. The gH Premium plan increases your available storage and data transfer to 1GB and unlimited respectively. You also get SSH access here unlike with the base plan. However, it’s still limited given that you can only have ten email accounts. Larger websites requiring a lot of storage space will need to look for a different host. That said, Greenhost does provide value-added services like anti-spam protection. It also has a few advanced tools including MySQL databases, PHP, CGI, and Perl support. Beginners, on the other hand, do not have much support given that Greenhost offers neither an auto-installer nor CMS support. However, considering that there is FTP access, a short tutorial will help you upload the files you need to. Despite the limited resources, Greenhost is an excellent choice given its quality of service and the non-contribution to global warming. This is, of course, the main thing that sets them apart. Also, as a client, you can display Greenhost’s seal on your website to show that you are using an environmentally-friendly web host, which may work well for marketing. Eco-friendly web hosts hardly ever have low prices, and that’s no surprise given that they pay higher bills to offset carbon emissions. Greenhost is no different. Its prices are expensive considering the scant amount of resources you get. While this may seem like a downside, note that it’s a good investment for the environment. Greenhost’s customer support is accessible via phone, email, and support tickets. Support is not 24/7 though: they only respond from 9:00 a.m. (email) or 9:30 a.m. (phone) to 4:00 p.m. EET on weekdays. I didn’t get a response when I sent an email, so if you have an urgent issue requiring assistance, phone support might provide a faster response. 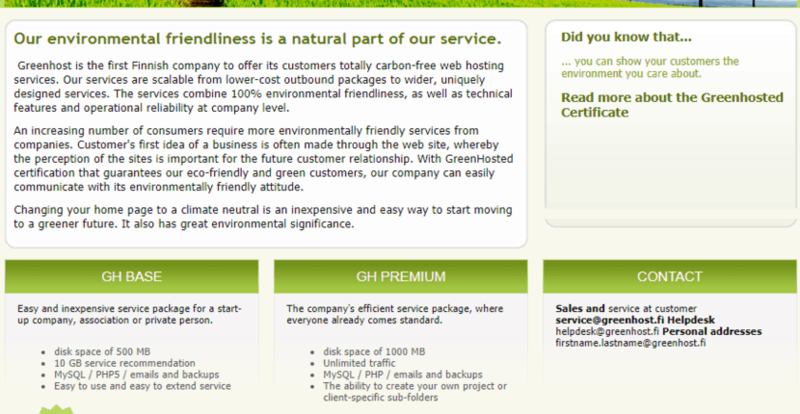 Greenhost dedicates itself to providing hosting without leaving a huge carbon footprint. The company offers hosting solutions that may be a good fit for small businesses, but these packages lack advanced features. Larger business websites will need to turn to another hosting provider. Check out Greenhost’s web hosting options today! Wondering how Greenhost stacks up against other Web Hosting companies? Enter any other Web Hosting company and we will give you a side-by-side comparison.